'Internet marketing is completely disrupting my work!' If this is how you view Internet marketing no wonder you're resistant to it. One of the biggest obstacles in business management is adapting or integrating new ideas while working. Hello? Finally, someone understands your dilemma. It's not that you hate change. Change can be good. It's, 'Who has the time required to make the change!' After all it's not like you can just stop what you're doing and go take a new course. Difficult? Yes! Nearly impossible is more accurate, right? But let's face it, you deal with difficult situations when they arise, because you must. They force you to take action all the time. For example, if the chef quit at your restaurant you wouldn't shut the kitchen down while you find their replacement. Or if a housekeeper quits in the middle of your busiest season you don't tell guests you simply can't clean their room today, you adjust. You do whatever it takes to get through transitioning or crisis and integrate as seamlessly as possible. I understand the resistance, however, if your guest list is not where you'd like it to be (need it to be) or dwindling you should consider it an emergency. Your resistance is an obstacle in your path to success. You simply will have to adapt sooner or later and later will cost you. Picture yourself still resisting change, years, maybe even decades, behind drowning in debt and nearly out of business seeking a last resort reality show gig, akin to Restaurant Impossible, to save your business. It's time to adjust your 'needs urgent attention' list to include your inadequate marketing. Resistance is futile! From here on let's call it and think of it as iMarketing - because for you it's about marketing yourself; your business in today's world. 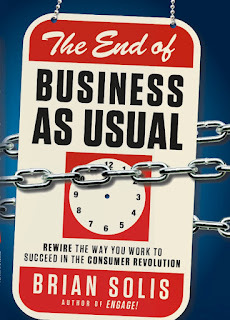 I'm recommending a good read called: The End of Business As Usual by Brian Solis. Available through his website or through AudioBookStore. It's about rewiring your thinking. As a side note: when it comes to finding time for growth or change while working, I highly recommend books on CD or downloadable audio books. Rather than trying to make time to read a book, you can listen to it, as I do, while driving.